Barbilee Hemmings, a.k.a. Bubbles the Clown, was cruising along at 50 mph in a school zone, on a school day when kids were present. As luck would have it, the Edmonton, Canada, resident had left her license in her "real" pants. "I was in full makeup, colored hair and baggy pants, so when the officer walked up to my window I stuck my head out and in my loudest 'Bubbles' voice said, 'Of course you can have a balloon animal, officer. Do you want a doggy, or an airplane or a butterfly?'" Once he was able to compose himself and stop laughing, the cop let Bubbles go with a warning. 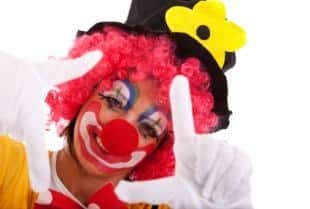 0 Responses to "I'm such a clown"